Attention please, boyzes! It just can't get more stunning and surreal than this! 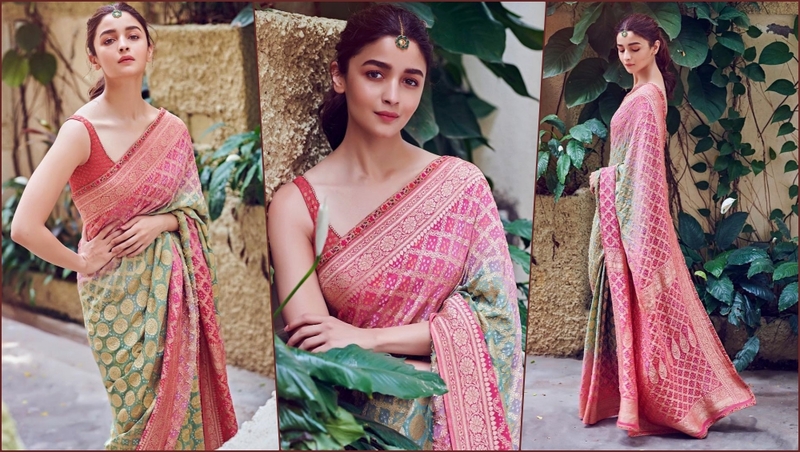 Here's Alia Bhatt, clad a designer saree, only to give us a glimpse of what could possibly look like angelic realms. So she is straightaway borrowed from the fantasy land for these classy visuals or so does it seem. There's an air of understated calmness about the star that is enormously overpowering here. So much so that men would like to take her home (instead of those blase date nights) to impress their moms! b) The accessories are very minimal and that works in her favour! The best accessories she has worn here is the warmth of her personality and that cute smile! c)She keeps the whole affair non blingy and her flawless complexion only heightens the charm on display. Alia's frame and her body constitution has been taken into due consideration to make this look complete in the truest sense of the word! Guys, and gals, do send us your feeedback on this look of Alia, in our comment section below and also let us know what makes the Bhatt babe a total stunner that she undoubtedly is!